Sacred Harp singing, or shape note singing, is participatory, a cappella, four-part harmony sung with full voices–and it’s fun! The shapes can be a little challenging at first, but sit next to someone who knows what they’re doing and you’ll be fine. The workshop will start with a brief singing school introductory lesson, then we’ll jump right in to singing. Loaner tune booklets will be provided. 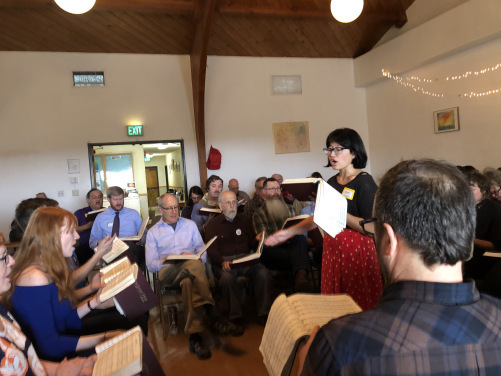 Bay Area Sacred Harp (BASH) is a group of singers that coordinates local, regional and statewide shape-note singing, primarily from the Sacred Harp 1991 Edition. We think everyone can and should sing!